Be a Cowboy for an Hour or a Day. 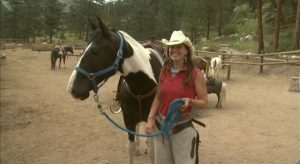 Experiencing the mountains on horseback is unforgettable. 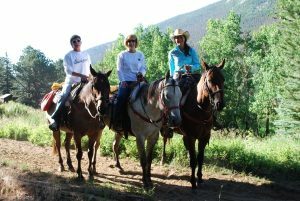 Enjoy miles of scenic, secluded mountain trails through Rocky Mountain National Park or Roosevelt National Forest. Each ride offers you a true mountain experience. Click the tabs above to discover what we offer and decide which ride is ideal for you and your party. 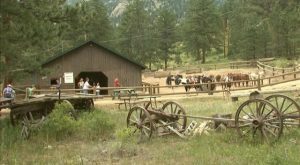 Enjoy a 2 hour ride through Rocky Mountain National Park with a dinner following the ride at the Trailhead Restaurant located at Gateway Fall River Visitors Center. Dinner will be ready to serve immediately following the completion of the ride. See the full menu available here. $50 plus a 25% discount on the full menu options (excluding alcoholic drinks) from the restaurant. – Make a Reservation Today! Reservations are highly recommended. Some dates will not be available. A minimum of 2 riders to reserve a ride is required. If you wish to cancel, the sooner you contact us the better. 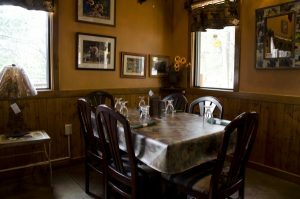 For the dinner ride we require your cancellation notice at least 24 hours notice prior to your ride. Our most popular trip follows the babbling Fall River to the beautiful Hidden Meadow and rides through enchanting Little Horseshoe Park. Chances of viewing deer, elk, coyotes, porcupines and other Rocky Mountain National Park Residents are good as we ride through their natural habitat. Wildflowers dot the area, surrounded by the snow-capped Mummy Range. A treat for all ages and safe for all levels of riders. $60 – Make a reservation today! Reservations are highly recommended. Some dates will not be available. A minimum of 2 riders to reserve a ride is required. If you wish to cancel, the sooner you contact us the better. For 2 hour rides we require at least 2 hours notice prior to your ride. 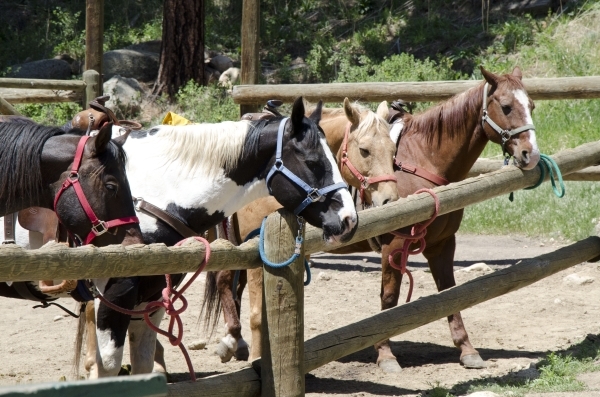 A leisure paced, relaxing tour on horseback of Horseshoe Park to Endo valley. Following the Fall River and viewing some of thereafter effects from the 1982 Lawn Lake Flood makes this a close-up encounter with one of “Rocky’s” most popular areas. This 4 hour ride for school age or above, and any skill level of rider. Leaves daily at 8:00 am and 1:00 pm. $90 – Make a Reservation Today! Reservations are required to prepare the horses. Some dates will not be available. A minimum of 2 riders to reserve a ride is required. If you wish to cancel, the sooner you contact us the better. For 4 hour rides we require at least 24 hours notice prior to your ride. This Mountain Ride that takes you to the summit of Deer Mountain. View Moraine Park and the Continental Divide. At 10,013 feet. bring your lunch so we can take a break at the top! Also, don’t forget to bring a jacket! Arrive early so we get to all the views on time! $130- Make a Reservation Today! Reservations are required to prepare the horses. Some dates will not be available. A minimum of 2 riders to reserve a ride is required. If you wish to cancel, the sooner you contact us the better. For 6 hour rides we require at least 24 hours notice prior to your ride. 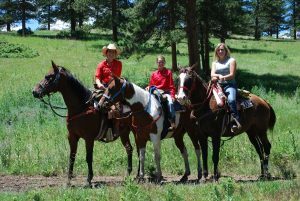 For the adventurous spirit or the true horse lover, trek through Horseshoe Park and follow the Roaring River on our 8 or 9 hour trail trips to the sparkling Ypsilon Lake or to historic Lawn Lake, at timberline. View the devastation of the 1982 Lawn Lake Flood, and witness nature’s ability to heal its wounds. Please arrive early to make sure we get you out on time! 8 Hours: $150/ 9 Hours: $170- Make a Reservation Today! Reservations are required to prepare the horses. Some dates will not be available. A minimum of 2 riders to reserve a ride is required. If you wish to cancel, the sooner you contact us the better. For 8 & 9 hour rides we require at least 24 hours notice prior to your ride. Click Here for More Questions & Answers! Snacks or small meal depending on your ride length- these can also be stored in your saddle bags. Forty years ago, the original owners, Steve & Carolyn Kokjohn, decided that their stables would have horses that, “look as beautiful as the privately owned horses.” Each gelding in their huge herd has a name, brand name saddles, and proper equipment determined by their needs and preferences. Special and individualized attention is given to each horse, to ensure the highest condition, quality, appearance, grooming, and well-being. Like their horses, all equipment is thoroughly cleaned and conditioned every year. Blankets and fleece cinches are hand-washed to ensure comfort and safety practices reign supreme in both the stables and on the rides. Today, the family legacy is carried on by Jessica Kokjohn. Jessica, who was Iowa’s 1997 Rodeo Queen and an experienced horsewoman since childhood, operates the business with the utmost standards and respect for both horses and the public. Jessica is one of the rare among us who is living her dream.